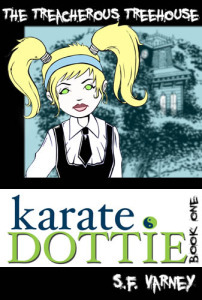 Karate Dottie is a determined and fierce little girl who dreams of growing up to be a samurai warrior much to the dismay of her parents and the amusement of her classmates. Her best friend is the portly big hearted Gordo who always gets in trouble because of Dottie’s wild and outlandish schemes. In her first adventure, one of Dottie’s classmates suffers the loss of a beloved pet in a tragic accident. While attending the funeral, Dottie comes up with a misguided plan for her and Gordo to reunite them. Things do not go exactly as planned and the unintended consequences are chilling. Karate Dottie and the Treacherous Treehouse is available from Amazon or your favorite bookstore in ebook and paperback. Karate Dottie and the Alien Menace will be available soon.